Phong Nha – Ke Bang, situated in Bo Trach and Minh Hoa districts of Quang Binh province in the North of Truong Son; in the North Central Coast region of Vietnam, is one of the most beautiful national park in Vietnam. In 2003, Phong Nha – Ke Bang was designated a UNESCO world heritage site, which contains the oldest limestone mountains in Asia, formed about over 400 years ago with the huge area of over 200.000ha. Being called “Kingdom of Caves”, this place is a system of majestic limestone mountains, under these mountains, there are over 300 caves multi – shaped with the mystery and fascinating of nature. It absolutely is an attractive place for people who like exploring nature in this paradise. From the 1990s, huge caves and unknown ghotto systems have being discovered each year. Son Doong cave, discovered in 2009 by Bristish and Vietnamese explorers, is recognized the longest cave in the world. Besides the distinctive limestone foundations, the river system contains strange named rivers as Trooc river, Son river, Chay river… with the fresh blue streams winding among the limestone mountains with forest, making Phong Nha – Ke Bang becomes a magleficent painting, a heaven in real life. In this national forest, there is existing tropical forest containing many species of rare plants recorded in Vietnam red list like: Platanus Kerrii, Agarwood…When tourists visit this place, it is fantastic for them to meet and contemplate many rare animals listed in Vietnam red book. 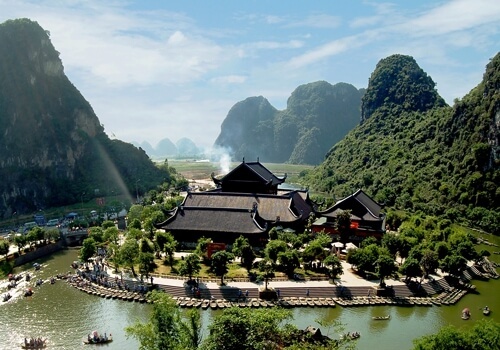 Besides the function of a national park, this site also has historical and cultural heritages as Cham culture, ancient Vietnamese’s signs and antiquities reflecting elite Vietnamese culture. Located in Ke Bang limestone mountains in Bo Trach district, Quang Binh province, Phong Nha Cave is surrounded by green tropical forests. 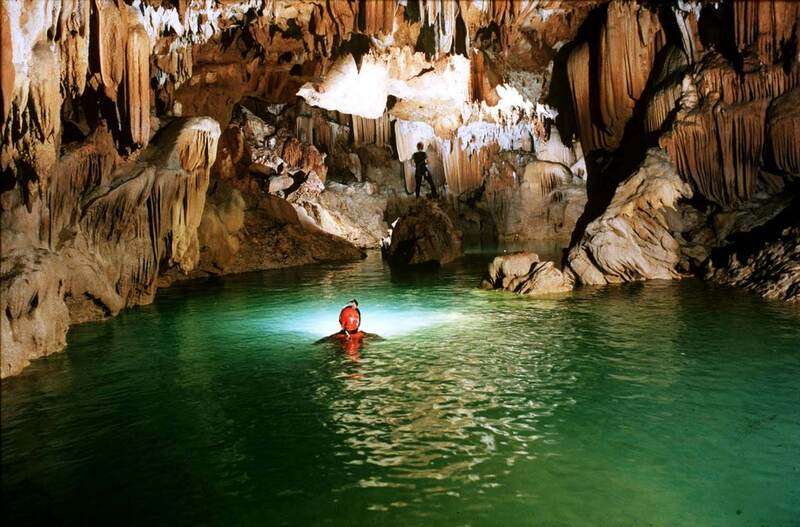 This cave is a water cave at the length of 7.729 meters containing 14 grottoes. Phong Nha cave is recognized the second biggest cave in Vietnam. The process to create Phong Nha Cave, a natural process, was happened 250 millions years ago from nowadays with the major topography is limestone mountains and land mountains. 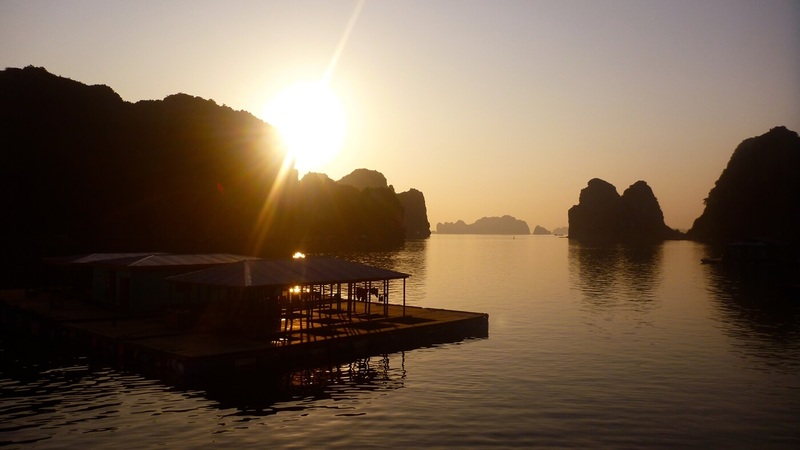 The journey to Phong Nha Cave is begined with go along Son river by motorboat. It takes about 30 minutes to reach the entrance of Phong Nha Cave. Grand nature with majestic mountains, green giant trees along 2 river banks astonishing travelers makes Phong Nha Cave becomes a worthy tourist attraction in Quang Binh and in Vietnam. Sometimes, at the view of motorboat, tourists can see actions of human life as: childrens wash bodies in this river, local woman wash their hair, old man fishing… all of them make the real life picture of Phong Nha more fascinating but still simple and closed. Reaching the entrance of Phong Nha cave, tourists will be overwhelmed because the heat of Laos ‘s wind is replaced by the refreshment and cool atmosphere. Go inside this cave, the sights are different at each distance, but almost is captivating stalactites converges with strange shapes, colors and tourists can imagine many things from these stalactites converges, which may be a rainbow, sometimes be a lion, Buddha statue and some people think these look like a gentle face of genie or evil face of monster… Just showed in some sentences but the miracle of Phong Nha Caves is displayed lively and undoubtedly you can’t stop your adivity to come here! Paradise Cave, a cave in Phong Nha National Park, located in Bo Trach district, near the west branch of Ho Chi Minh highway, far about 60 kilometers to the northwest of Dong Hoi city. 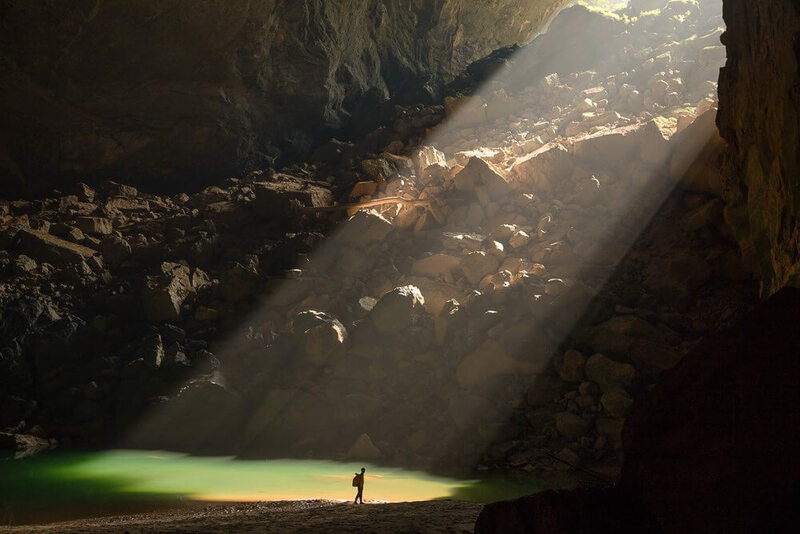 This cave explored by the British Cave Research Association has the length of 31 kilometers, longer than Phong Nha Cave considered the longest cave in Phong Nha National Park, but just has only 1 km opened for tourists visit since 2011. But nowadays, it is opened 7 km and there are many services allowing adventurers explore more 7 km through this cave but it’s truly adventurous and need more safe requirements. Surrounded by tropical forest and karst peaks, the limestone foundation of Paradise Cave is more spectacular and magleficent than Phong Nha Cave. This place is a dry cave, so tourists only walk to visit with the tourguide. Inside this cave, it is a spectacular and breathtaking landscape with glimmering stalactites converges look like diamond and colossal stalagmites like huge crystal pillars. The hand of Creator not only clays unique shapes but also paints variety maverlous colors for Paradise Cave ceiling, and as its name, Paradise Cave is truly an underground heaven. 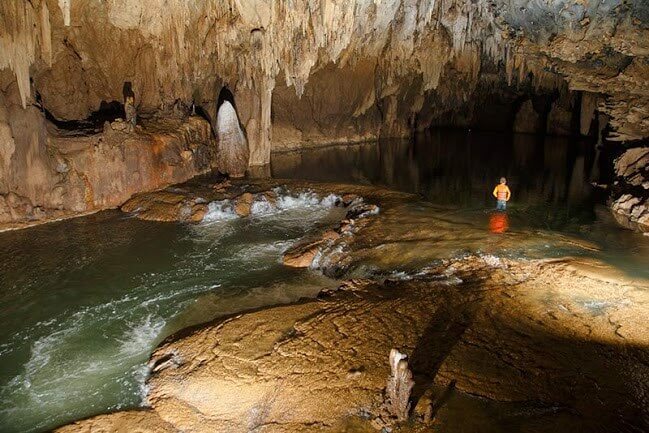 The special mystery is in the darkness of this cave still exists the survival of life with may species like: fishes, crickets, bat, spiders… Especially, when the wayhome, tourists have the option to swim in stream and enjoy the freshmen of cool water flowing from underground. Although Phong Nha – Ke Bang is too huge and tourists won’t have enough time to visit all of its landscape, but Paradise Cave is an essential and incredible stop. You will never disappointed because of visiting this place! Hiding among old dim trees surrounding the limestone cliffs, Nuoc Mooc Spring Eco Trail looks like a precious mysteric sapphire bringing the vitality for the whole Phong Nha forest. 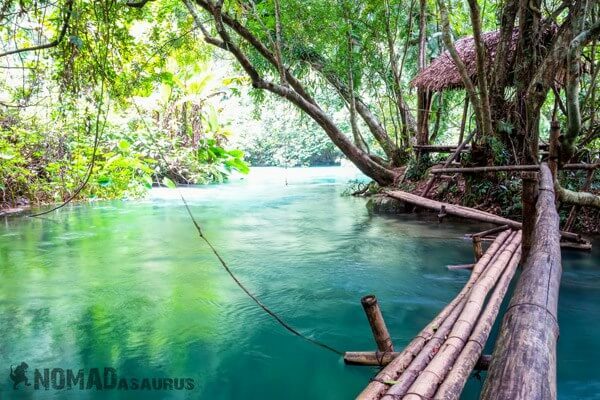 Located in Phong Nha – Ke Bang National Park in Phuc Trach commune Bo Trach district Quang Binh province, Nuoc Mooc Spring Eco Trail is situated in the west branch of Ho Chi Minh highway, among the North Central Coast having Laos ‘s wind and heat of summer. From Phong Nha Cave, it takes 20 minutes by car to reach Nuoc Mooc entrance. Nuoc Mooc is a option for tourists on the wayhome after the journey exploring the Phong Nha caves system. The stream with gurgling flowing sound and refreshment of water mixing with sound cheeper can make tourists relaxing and comfortable after adventurous journey. 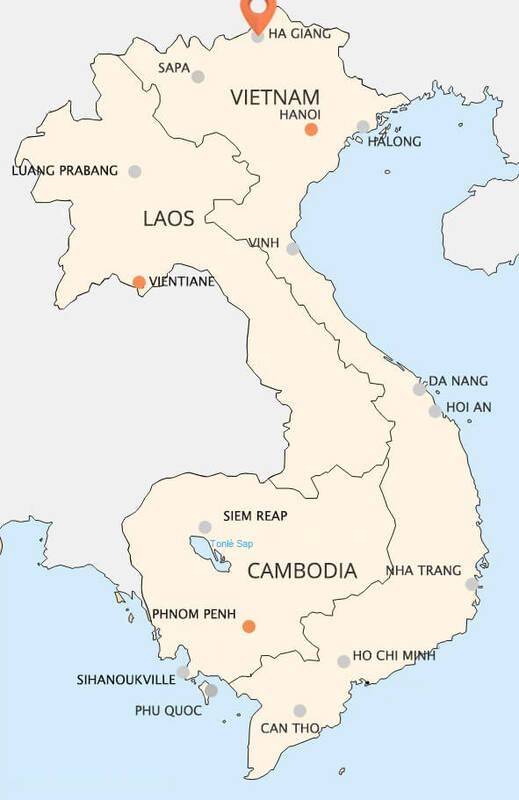 This name “Nuoc Mooc” means the unknown source water line flowing from the corner of mountains with the average degree is from 15oC to 18oC in summer. Tourists not only immerse in fresh stream, fishing by themselves, but also enjoy many traditional food of local people as: grilled fish, shrimp, mountain crab… In additions, when walking along 2 river banks, it is amazing because sometimes you will meet beautiful rare orchid flowers and some forest butterflies flying arround and parking on your shoulder. 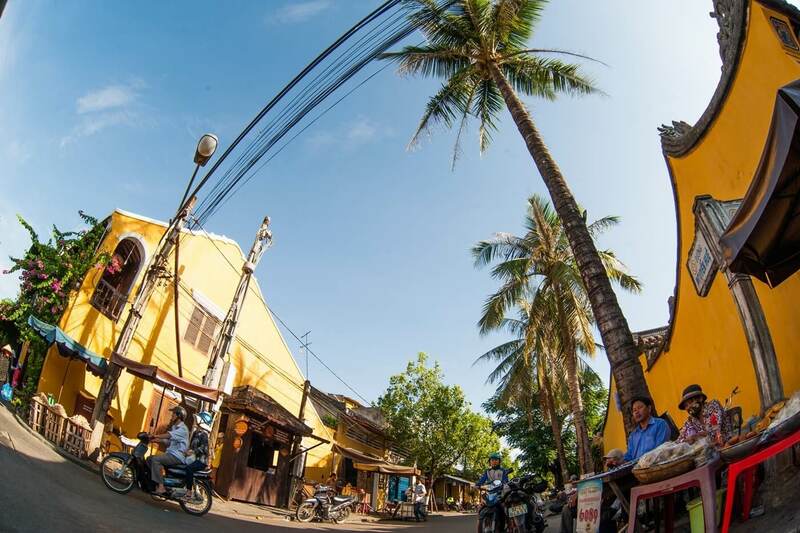 The nature of Nuoc Mooc Spring Eco Trail is truly charming retaining tourists. Hang En cave is located in Phong Nha – Ke Bang National Park, an attractive site of Quang Binh, Vietnam. “En” is name of a kind of bird – Swifts. Despite of being known location for centuries, in 1994, this cave was first explored by British explorers, who were expert on caves. He found that ethnic minorities from nearby villages have used this cave as a shelter to hide from hurricanes. It’s also an ideal place for local climbers, who have exploited the nesting swifts for sale or their other demand. Hang En is considered to be the third greatest cave in the world, just behind Son Doong Cave and Deer Cave in Malaysia. It stretchs for 2 km inside limestone mountains of Phong Nha – Ke Bang. There are three main entrances to visit inside this cave, and the biggest is over 120m tall and 140m across. Tourists will enter the cave through broad slits on the cliff, then cross the mystical passageway towards enormous borders with penetrating sunlight illuminates the way forward to reach the peak and complate the wonderful landscape – a wide, romantic sandy beach with an aquamarine were completely covered by lots of great caves and limestone. Tourists would believe that they have just had a time travel, back to the primitive era, when the Earth was so primitive and natural. Phong Nha – Ke Bang National Park is famous for having many gorgeous caves, and the greatest is Son Doong Cave. Son Doong is the world’s greatest natural cave, was found by a local man, Ho Khanh, in 1991 when he was finding a rain shelter. The whistling sound of wind and stream in the cave through its entrance as well as craggy terrain prevents local people from exploring its. Only in 2009, a group of cavers, also scientists, from Britains led by Howard and Deb Limbert came and conducted researchs and then announced to the world. Mother Nature created Son Doong Cave about 2 – 5 millions years ago by the eroding of river waters to the limestone underneath the mountain. Its entrances is result of collapse of weak limestone. 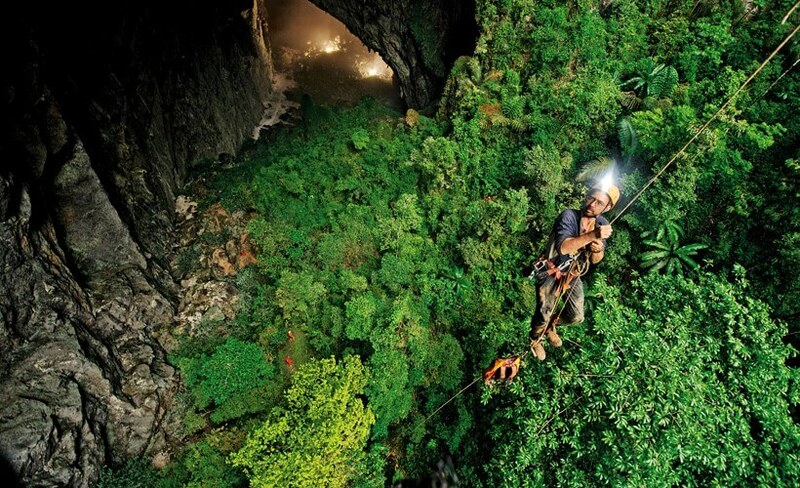 Son Doong Cave is about 150m width, 120m high and over 9 km length, so it have passed Deer Cave in Malaysia to become the greatest cave all over the world. Not many people have a chance to see the beauty inside Son Doong Cave but very soon, this primitive beauty will be easy to complete. Imagine going straight deeply into the biggest cave ever, it is an unique expendition. 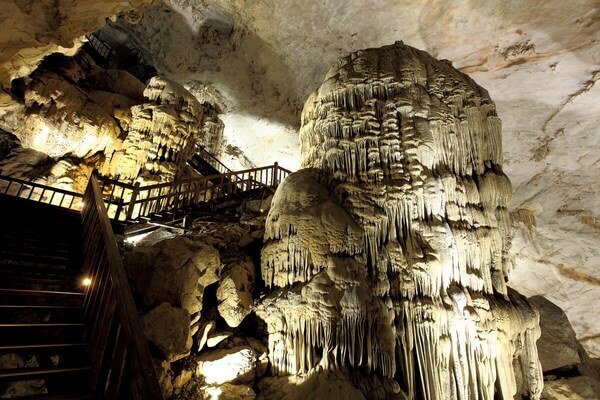 You will be astonished because of the glamor spaces with enormous stalagmites, statuesque stalactites,… That’s undoubtedly an unforgettable experience for anyone. 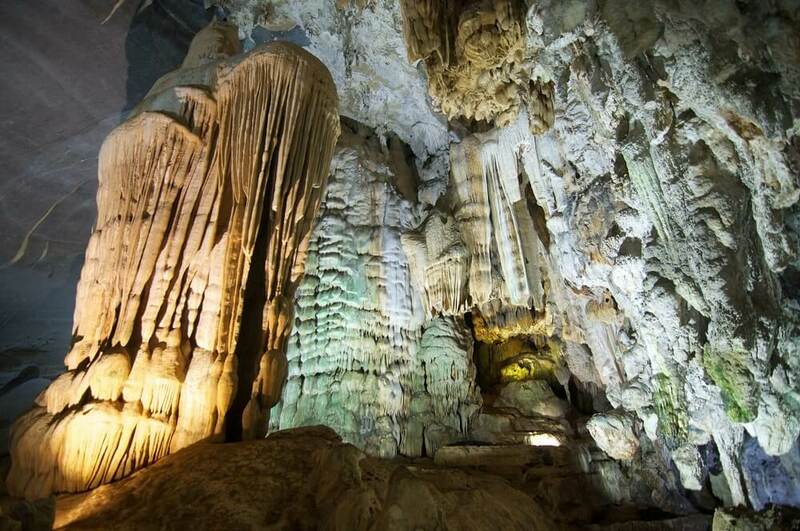 Tu Lan cave system is located about 70 km from Phong Nha – Ke Bang National Park, in Minh Hoa district, Quang Binh province. This system includes 8 caves, was first discovered in 2009. Tu Lan cave system is still pure and prestine, hiding a lot of secrets of nature inside majestic limestone mountains, underneath rivers and endless waterfalls. To be able to see gorgeous landscapes, tourists have to cross rugged mountains, craggy forests, walk among vast valley, wed slippery mud and cold waters. But, the subtle beauty of natural caves with stalactites, mysterious underground river and the wild of mountains and forests, all of difficulties is deserved. Aside from the beauty though, the adventure of swimming through the river caves will makes this tour completely diffirent from anything else. When you swim slowly through each cave, you will be surrounded by gorgeous limestone formations, only seen by the light of your flashlight, and the fading daylight from the entrance right behind you. It’s certainly a wonderful trip.